When designing a home, adding art may seem like one of the final steps of the process, a finishing detail that pulls it all together. But I often take the opposite approach, especially for a client who has or is interested in building a robust art collection. Why? Art is the best way to add personality, color and interest to a space, and it’s one of the key drivers in making a house feel like home. Keep reading for my tips for curating a unique art collection and designing a cohesive space that puts that collection in the spotlight. Project: Downtown Denver Loft. “American Beauty” by artist Kevin Sloan, acrylic on canvas. Before I begin the art hunt for a client, I get to know their personalities and taste preferences. If I have a client with a turn-of-the-century home who loves a more traditional style, I might consider a landscape in muted tones. Or if I’m working on a young couple’s hip new condo, I might look for more abstract works and bolder colors if that’s the direction they’d like to go. The key is to only buy pieces you truly love. So before you start your search, do some research on different mediums, artist and genres of art to find out what lights you up. A genre category could be a landscape, portraiture, still life, religious themes, historic events, or any kind of traditionally idealized subject matter. Do you keep coming back to an 18th-century oil painting? Are you partial to contemporary photography? Or do you like a mix? One of the best ways to figure out your style preference is to head straight to the gallery. If a client comes to me with little to no existing art collection, we spend a day or two visiting a range of galleries to find out which specific pieces they gravitate towards. My favorite galleries to peruse in Denver are: Walker Fine Art, Space Gallery, William Havu Gallery , Robischon Gallery, K Contemporary, and Michael Warren Contemporary. Project: Berkeley. “Untitled” by artist Nicholas Wilton, mixed media on panel. 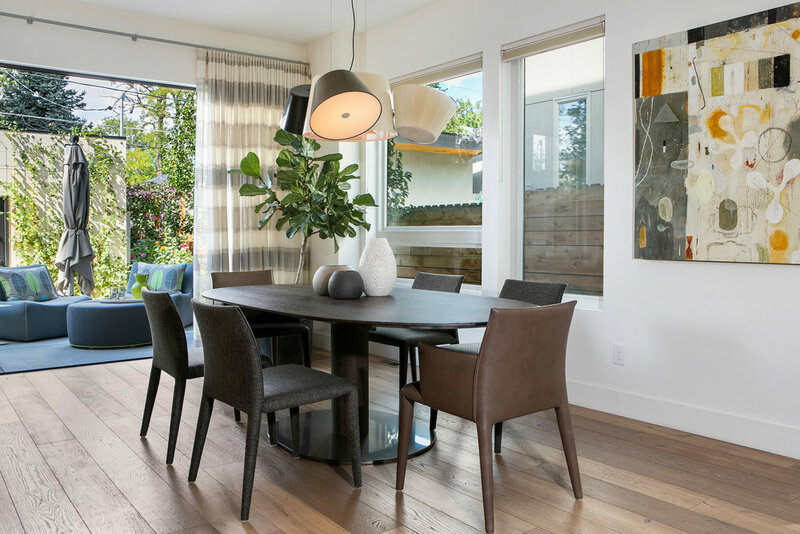 When you’re ready to buy a few pieces of art for your home, make sure there is enough variation among their tones and subject matter that will make them stand out among one another, but not so much that they don’t provide a cohesive feel. For example, an abstract painting and a traditional landscape may be from different genres, but can be paired together if they both share similar color tones. Collections that incorporate a few different genres feel more robust than collections that use the exact same style or color over and over again. When working with a client’s existing art collection, I sometimes stumble upon groupings of smaller pieces with the same theme—i.e. paintings of barns or a series of historical family photographs. 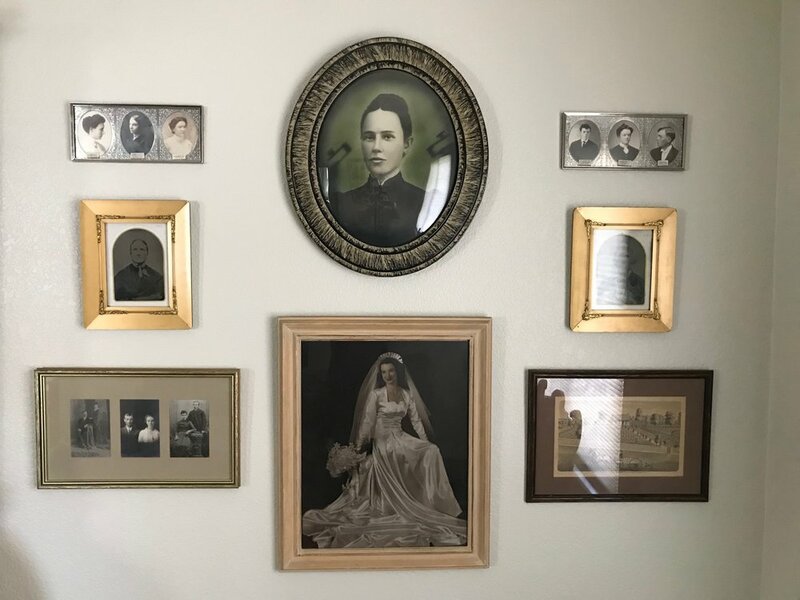 I like to spotlight these collector’s items by creating a feature wall with them. By doing this, you are creating a point of conversation and a way for the viewer to learn more about you. When scattered throughout multiple areas of the house, the pieces can look disjointed and clutter a space, but when packaged together on a gallery wall, it spotlights the client’s interest while creating a clean, uniform look. Project: Cory Merrill. “February Wetlands” by artist Karen Scharer, oil on canvas. When choosing a color palette for a client’s home, I look to their art collection first to create cohesion and balance. If I have a bold piece of art that I think belongs in a space, then I might go with a more muted rug with a subtle pattern. Or if my client has a particular love for a certain painting that has a predominately dark palette, I might layer in furniture fabrics in hues of the same colors to coordinate with the piece without matching it exactly. The goal is to create a mood and feeling throughout the home, all while celebrating the art and artist as the focal point. Looking for more inspiration? Visit my portfolio page for a glimpse at my art-filled approach to design.